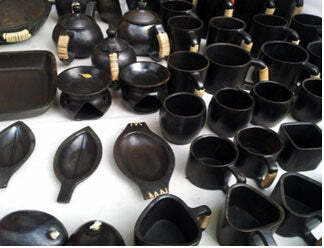 Black pottery or Longpi Pottery is handcrafted by Thankhul Naga tribes of the Ukhrul district of Manipur. It is a traditional craft from Manipur and derives its name from the village Longpi in Manipur, India. Longpi pottery is one unique art where the potters do not use the potter's wheel. There is no use of chemicals, machines or wheel in the making of this pottery. It holds an elite status in Manipur these potteries are called 'royal pottery' because only the royalty and the rich of Manipur could afford and use it for cooking of meat during major occasions like marriage and Luira festival. With a black background and few motifs, this art form expunges the "great divide" of practicality and ethnicity. An absolute must for eco - friendly enthusiasts! Almost every family in Longpi knows how to make black stone pottery, an art that is unique to this village. Whether they sell it or not, they do make the pots for their own use. The blackware pottery demonstrates how deeply traditional crafts are linked with nature. The material used in Longpi is made from a mixture of Black serpentinite stone and weathered rock which are mixed in a three to one ratio. The strength is provided by the serpentinite rock and the weathered rock acts as a binding agent. The paste formed from these is then rolled by hand into desired shapes. The artisans use basic bamboo implements and the appropriate movements of their body to give shape to their creations. The structures of saucer cups, kettle, frying pan, fruit bowls, cooking pot etc. are put in a kiln and set on fire for around five to nine hours till it reaches 900 degrees Celsius. After which it is polished with local leaves called Imlay (Strobilanthes cusia) and Kuhi (pasania pachiphylla) which provides the black colour and luster to its surface. The final products are gray-black cooking pots and kettles, charming bowls, and mugs and trays, frequently accompanied with a lacing of fine cane at the handles and knobs. They have a distinctly earthy, yet contemporary appearance. Longpi Hamlei pots and pans can be used for direct cooking over gas stoves or firewood, and are microwave-safe as well. Although several of these pottery items are decorative in design, they are conceived for utility-cooking and prepared with a basic hardiness. Particularly, these pots are good for simmering and slow cooking for hours over a low flame, homogenizing and condensing meat and lentils. The contents of the pot continue to sizzle for a long time after it is taken off the heat, ensuring that the food continues to remain hot. It is believed that Longpi ham used to be the main cooking utensil among the Tangkhuls before the advent of aluminum pots. Longpi ham as of today has attained national and international popularity. Traditionally Longpi artists make tea pots, mugs and bowls (which are heat and water resistant) for cooking, brewing country rice beer etc. They're all black in colour, simple and almost minimalistic. 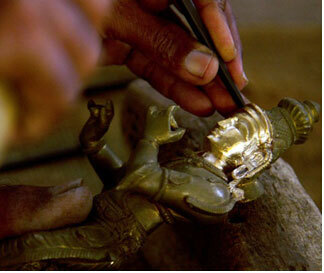 Artisans use their hands to mold these pieces of art. What gives Longpi its appeal is the finish. It is smooth and lustrous. When one touches, the fingers glide over the surface, and leave one wondering if this is stone, lacquered wood or clay. This effect is due to the presence of crushed stones mixed with clay that are naturally found in the mountains of Manipur. Today, people use Longpi pots as flower vases, decoration, serve-ware, kettles, mugs etc. 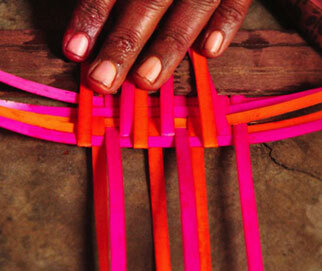 Another interesting feature is the cane weaving done as an embellishment or a design detail. The natural golden color of the cane creates a striking effect over the deep dark surfaces of these products. Unfortunately, the traditional markets of these products are diminishing. By developing new designs, it is our humble effort to present this fascinating craft to the contemporary buyer, hence creating a new market for this age old craft. Palm leaf Basketry is one among the well-known crafts of Tamil Nadu State. Palm tree also known as Palmyra tree is one of the important trees in Tamil Nadu, whose basketry is the major source of income for the rural communities. Palm leaf baskets are made of very intricate designs, which have a special attraction. The products are mainly used for local or daily activities. The palm leaf basketry is locally called "Kottan" in Tamil Nadu. The experienced and skilled artisans develop new varieties of designs according to the taste of the local people and market. This craft originated with the Nadar community near the Keelayapatti village in Karaikudi, who used to climb the Toddy Palmyra trees to tap toddy. The craft was perfected by the ancestors of 'Nagarathars' who used palmyra leaves for writing, drawing, crafting artistic items and making utility products. The Kottans had wide and varied uses in their daily life, most importantly during marriages. The 'Aachis' of Chettinad used to make varieties of baskets out of tender palmyra leaves and leaf stems, which are called 'Kottans' and 'Koodais' respectively. Mainly women artisans are engaged in making these baskets in a traditional way. The pliable, tender Palmyra leaf has good structural strength, so it is used to make decorative Olai (leaf) baskets. The midrib of the leaf is removed with the help of sathagam (knife) and the leaf is cut into strips of required size with the help of a cutting machine locally called Ole machine. These strips are then taken for dying process. For plain baskets the leaf strips are dipped in boiling water and kept to dry; for colored basket the strips are dipped in colored water. Before weaving, the basket water is sprinkled on the strips to keep them moist and avoid breakages while weaving. Based on the required size of the basket the palm strips are arranged vertically and horizontally interlocking each other. A wooden slab is placed on it and held with hands and feet for support. 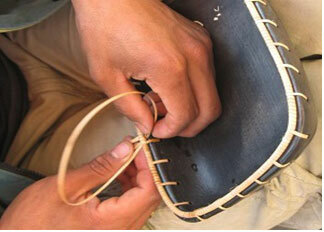 Once the base has been woven, the strips are bent and the sidewalls of the baskets are interlaced and woven. At the end, the midrib of the leaf is used as a rim and is woven at the mouth of the basket with a thread for strength and for enhancing the look of the product. Palm leaf baskets are double-layered and reinforced at the rim with a stronger material. Palm leaf basketry making is craft practiced from many generations and has been a culture and tradition in Chettinad. The tools and raw materials used for making the products are easily available in the local market. 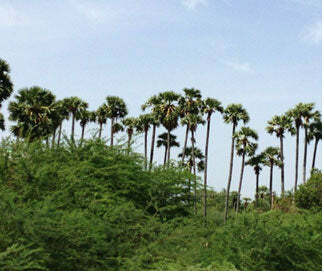 Palm trees are abundantly available in Karaikudi as well as nearby villages. Artisans use long knives to harvest the leaves and small sized knives to separate the mid rib from the leaves. 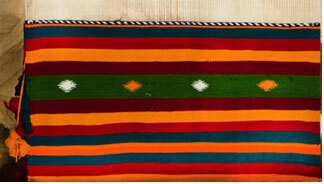 The strips are dyed with vibrant colors to make the products more attractive. Leaf strips are dyed in different colours. This knife is used to cut the midrib of the palm leaf. Ole is a cutting machine used to cut the leaves into equal strips. Colors are used to dye the leaves. Beads are used to decorate the baskets. Alum is added in the color for dying process, helps to strengthen the color richness. Varieties of products are made using the palm leaf - baskets, fruit baskets, mats, pen stands, flower vases and gift boxes. The baskets are used as storage containers as well as decorative items. Earlier, kottan baskets were mainly used during marriages for packaging gifts and for containers filled with offerings to give at family functions and rituals. The art and craft is being revived with design, process and marketing interventions and many articles of modern utlity are now being made. Pallava architecture and the Pallava Lion, inspired the architecture of the Hindu colonies of Indonesia and Cambodia and later the Singapore Merlion. 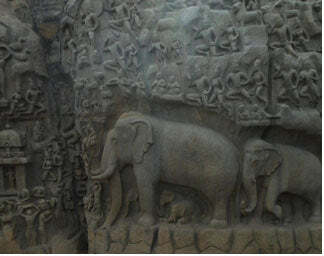 The Pallava dynasty ruled from Kanchipuram and Mamallapuram and greatly influenced art and architecture of the time. 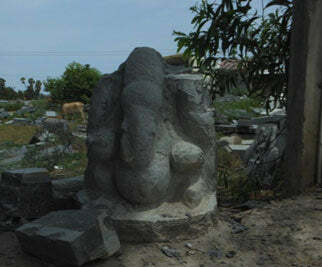 Sculptors - mainly around the shores of Mahabalipuram - come from a tradition and training of Dravidian style of sculpture, trained at the Shilpashastra based Sculpture and Art college. The sculptors have experience of having worked on temples around the world and on small and large complex installations and projects. They are well versed with the traditional and religious aspects of sculpture. 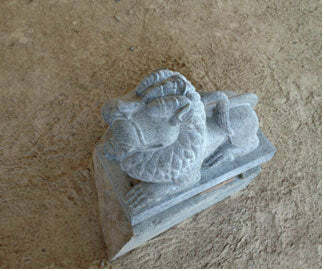 They work with different techniques to cut, sculpt and finish hard granite to perfection. 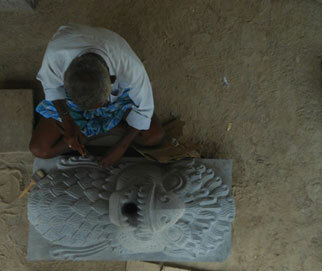 Work is done on sculpture pieces ranging from 6 inches to 20 mtrs in height. cutting of the shape of the sculpture and a few marking strokes are done with a marker to start the process of detailed sculpting. A combination of grinding, sculpting and finishing then completes the sculpture after many hours of hard-work by master craftsmen. 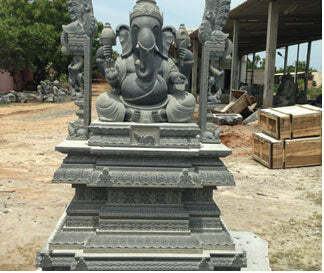 The stone sculpture studios around Mahabalipuram are abuzz with activity - sculpting figures that will be shipped to various parts of the globe. 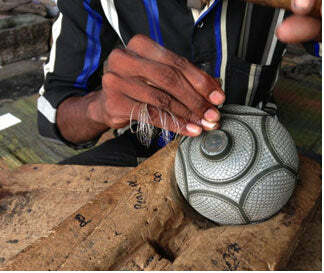 Bidri is an art of inlaying silver or gold on black metal. 'Bidri craft' is named after the place Bidar in Karnataka, from where it originated in India. The unique artwork was originally gifted by Persian artists. Skilled artisans from Persia were invited to Bidar by the Bahamani Sultans in the 14th century and trained local artisans in metal inlay work. Mughal and other local motifs are artistically etched and inlayed to create a range of vases, plates, hookahs and jewelry boxes. 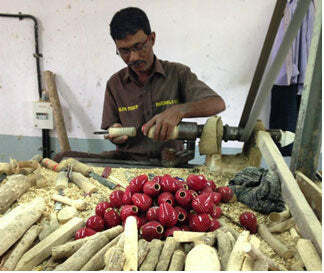 Melting the Alloy: Each Bidri piece is cast separately from ordinary soil made malleable with castor oil and resin. Processed 95% Zinc and 5% copper metal is melted. The molten metal alloy is poured in to the mould formed. The mould is allowed to cool and the object is removed. Casting the Article: The article is then rubbed with copper sulphate solution to obtain temporary black coating on which the designs are etched. Engraving and inlaying the design: The object is firmly fixed on a waxed stone to hold it in a way to engrave the designs on the article. 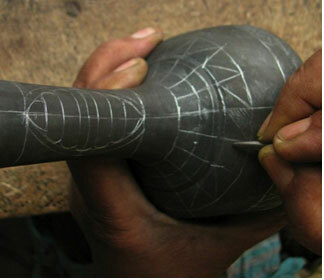 The artisan uses small chisels to engrave the design. Pure silver is converted into fine flat wires and hammered or inlaid carefully into these chiseled grooves. Oxidizing: In this stage a particular type of soil found in Bidar is mixed with ammonium chloride and water produces a very special solution. The solution darkens the body of product but has no effect on the inlayed silver wires. The article is then rinsed off in water leaving the silver shining against the black surface. 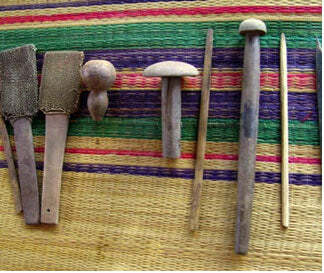 Metals: Zinc and copper are important raw materials used in Bidri craft making. File and Buffering Machine: Different types of buffing blades are used to smoothen the surface of the article. Copper Sulphate: It is applied on the cast object to obtain temporary black coating on the article, so that it is easy to sketch the design over dark background. Chisel: Used to engrave the design on the article. Silver Wire: Used to engrave in the design grooves. Brass Metal Wire: Brass metal wire is inlayed to enhance the outer appeal of the product. Coconut Oil: Once the product is made, coconut oil is applied to deepen the black matt coating. Bidri fort Mitti: Bidri fort mitti-clay is boiled and products are dipped in the mitti solution to obtain permanent black color. Bidri ware is a unique traditional art form made with mixture of zinc and copper, which is magically turned into deep dark black color at the end of the process. Sophisticated design motifs are inlayed to create glittering white contrast over black background. The traditional Bidri products are symbol of royal life, aesthetically adorns living spaces. Products such as hookah, shehnai – flower vase are created with Mughal motifs. Star motifs are used for surai-type of vase, ugaldaan, boxes, zalabchi, muqaba or round containers with dome-shaped lids, flower vases. Many animal motifs are used and include elephants, horses, peacocks, etc. Many Bidri themes are inspired by Mughal motifs presented in geometrical and flower patterns and have traditional names according to style of creation. Fine wire inlaying method is called tarkashi and is done using silver wires. Flower and petal motifs are created with silver sheet and is called taihnishan. Mehatabi kaam is the reversal of surfaces where the design is cut out in sheet metal and is inlaid. Embossed design is called Munnavat kari. Verses from the Quran in Arabic script are also include in some themes. Thanjavur has been an art centre of great importance throughout almost the entire history of Tamil Nadu. Today, the town and its surrounding areas including Kumbakonam and Swamimalai are a flourishing centre for bronze sculpture, stonework and paintings. Each Hindu God sculpture is a one-of-a-kind piece, created by the artisans who have been perfecting the art of the lost wax method of bronze casting for generations. The subtle smiles and classic poses are sure to bring a sense of serenity to any meditation room, home altar or temple. The earliest bronze statues in India were cast in the Indus Valley about 2300 BC, reaching an artistic peak during south India's Chola Dynasty (9th to 13th centuries AD). The patronage of dynamic Chola rulers during this period sparked an unprecedented growth in philosophy, poetry, dance, temple architecture and fine art. The imperial Cholas utilized their prodigious wealth earned through their extensive conquests in building long-lasting stone temples and exquisite bronze sculptures. These bronze sculptures show classic grace, grandeur and perfect taste. The best example of this can be seen in the form of Nataraja - the Divine Dancer. Step 1: Sculptors mold images from hard beeswax mixed with a small amount of dammar (resin) from the shal tree. The wax is carefully molded into separate parts that comprise the sculpture and then lowered into a basin of cold water where it hardens instantly. Step 2 : In order to join the individual pieces into a whole, they are returned to a malleable state through brief reheating. Simple tubular struts connect the hands of images to the body providing both stability to the wax model and channels through which molten bronze will be poured. While the wax is still soft, details, down to the individual beads of a sculpted necklace, are added with a sharp wooden chisel. Step 3: The fully assembled wax model is then encased with several layers of clay. Step 4: The heavily clay-encased mold is then baked in a fire pit, melting the wax, which runs out through the channels leaving a perfectly detailed, hollow clay mold. Specialized metal works now take over, heating copper with a small proportion of lead and tin (and in earlier times, small amounts of gold and silver). This alloy is carefully poured into the clay mold, which has been heated to the temperature of the molten metal. 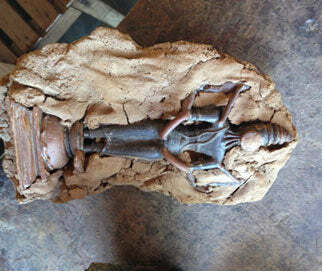 Step 5: After cooling for several days, the clay mold is broken open to reveal a rough version of the sculpture. Step 6: The sculptors carefully chip away the clay and then smooth and polish the bronze, a process that can take anywhere from a few days to several weeks. During the Chola dynasty, only the barest minimum of finishing work, such as removing the channels of bronze connecting hand to torso, would have remained at this stage. Today, however, artists resort to an extensive amount of cold chiseling that gives a distinct, sharp finish to the details.
. Tala - Used to determine the dimensions of the face of the image.
. Kartarimukha - A pair of scissors used to hold a weapon.
. Coal furnace- Used to produce the heat.
. Chisels- Used during finishing.
. Sand paper- Used to smoothen/ polish the surface of the metal image after revealing. Large procession idols are made for temples as per orders from both India and abroad. Smaller pieces are made for prayer spaces at home and are also made for display as art pieces. 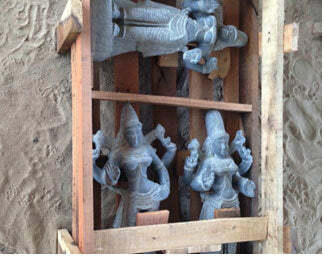 Most sculptures are copies of those produced in the preceding centuries, especially the Chola era. 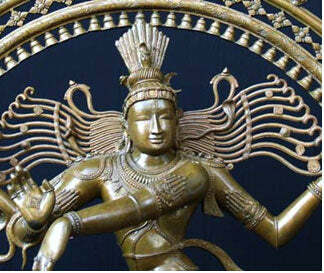 Bronze sculptures are an important milestone in the history of metal sculptures of India. As the Bronze sculptures are long lasting, they are created for eternity! The sculpture of Bronzes immensely radiates a sense of immortality and powerfully reflects the fascination and mystery about the ancient cultures of Buddhism, Jainism and Hinduism. Channapatna toys are manufactured by artisans from Channapatna in Karnataka, India. Channapatna is a small town located 60 km south-west of Bangalore, on Bangalore-Mysore state highway. The city is famous for its wooden toys and lacquer ware. These toys are manufactured in traditional or advanced small scale industries. These handcrafted wooden toys are made using traditional lacquerware technique and are colored with natural dyes. Channapatna more often known as the Gombegala Ooru "Toy Town" of Karnataka has a legacy of toys which goes back to more than 200 years. Centuries ago artisans from Persia were invited to train the locals of Channapatna. They started by carving toys out of ivory wood initially then switched to rubber, cedar and teak. This traditional craft is protected as a geographical indication (GI) under the World Trade Organization, administered by the Government of Karnataka. Today, this art and the craftsmen have broadened the horizon into several varieties of wood - rubber wood, silver wood, fine wood, Nepal wood, sycamore wood, red cedar, pinewood and teakwood. 1. Starts with procuring the wood. 2. The artists season the wood and cut the wood into the desired shapes according to the design. 4. Applying the colors using lac colors which are vegetable dyes. Lac is pressed against woodwork to be lacquered. Heat generated by friction softens lacquer. 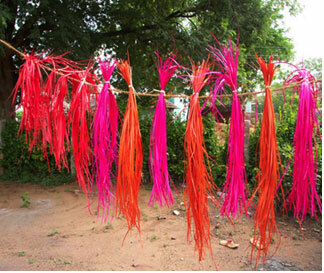 Vegetable dyes are used in the coloring process to ensure that the toys and dolls are safe for use by children. 5. Then the finished work-piece is filed and finished using sandpaper. The work-piece is coated with wax for sheen and luster. 6. The detailing of the figure is done using a permanent marker. At the end of the process the toys are ready to be packed and shipped! Channapatna still uses traditional machinery and tools in terms of production equipments. 1. The artisans have overhead belt drivers that are driven by a small motor and one end of the belt drive converts the vertical motion into horizontal circular motion. 2. The artisans use various measuring equipments such as a compass, angles, planes and a wide variety of other such instruments. 3. For chipping they use a number of files and chisels of different shapes and sizes. 4. Coloring is done using vegetable dyes while the wooden block is still rotating on the lathe. 5. Apart from the mechanized or hand machines they use a number of other tools to manipulate the surface of the toys, such as a drilling machine is used to drill holes in certain toys, a chisel is used to develop grooves and create curves on the surface, the vegetable dyes are used to impart eye catching and bright colors to the toys to make them attractive for the buyers and visitors who visit the village. Moreover there is a wide range of files of different shapes and sizes used to further manipulate the surface for creating other innovative designs on the toys. The Channapatna craft is a champion of curved forms and the excellent finishing makes it even more attractive. The products created in Channapatna are absolutely eco friendly, non hazardous and are very safe for children. The toys are without any sharp edges and non toxic. These products are made using soft wood and vegetable dyes. Products include traditional toys, home décor items, corporate gifting and utility items made in traditional and contemporary designs. Jamkhanas (durries) in Kannada means floor covering mats which are usually used during marriages and functions. These durries from Navalagund near Dharwad, Karnataka are well known for their structure, bold colours and form that makes them unique as compared to other durries. This craft is believed to have originated during the time of Ali Adil Shah of Bijapur. In the sixteenth century during the tussle between Deccan Sultanate and Vijayanagar Empire in 1565 AD, Jamkhana weavers migrated from Bijapur to Navalgund and continued this craft. Navalgund or Navelu in Kannada means peacock. These birds are found in abundance in this area and later got incorporated as a part of the pattern in the jamkhana. extending along one side of the wall. Two bamboo poles (rods) of the warp yarns are tied at the upper and lower extremities. This is a combination of a of pit loom and a vertical loom. Unbleached cotton yarn of 3/10s (10s is count of yarn) is used in the making of warp yarns for the required width and spread across evenly. Heddles are made by looping each set of warp yarns to operate as the individual shafts to raise and lower the yarns. 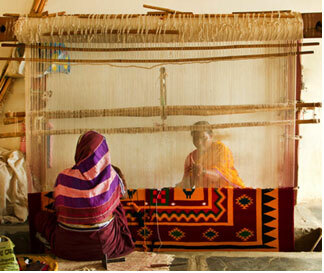 Weaving is mainly done indoors by the women in the house, where two weavers facing each other can work together on this loom. Weaver who sits at the backside of the loom operates the heddle raiser and weaves one half of the dhurrie width. Jamkhanas are woven weft faced where different colored yarns are inserted from the finger hanks moving in one direction and then return in opposite direction. Tibni (wooden tool) is used to guide the weft down its place. Weavers don't refer to any manuals or graphs and weave from their experience and memory which gives each jamkhana a human, individual touch. After yarns are inserted completely it is taken off the loom and the extra threads are trimmed. Each jamkhana is divided into three parts with centre and two ends, where centre is woven with geometric and simplified natural forms and the ends woven in reflected symmetry. Dominant color used is red which is used as the background in most jamkhanas, yellow to set the other colors to place within it. Green, black and white are used as accenting colors.
. Badi Ghari - Zigzag diamond shape with double edge.
. Nanhi Ghari - Zigzag diamond shape with single edge.
. Laheri - Geometrical pattern like a wave.
. Phul - Geometrical flower.
. Bel (bael) - Creeper pattern with zigzag edge.
. Chinda - Vertical stripes.
. Chunnat - Twill diamonds with extra weft.
. Dhara - Horizontal stripes.
. Pagadi Aata – Board of Traditional Indian dice game. Typical sizes of the jamkhanas are 1.5'x7.5', 2'x2', 2'x4 ', 2x6 ', 3'x6', 4'x7', 5'x7', 10'x6' and 12'x6' and are mainly used as floor mats. .• Tottale Jamkhana It is the smallest of the jamkhanas of 1.5x4' width with a square at the centre filled with geometrical forms, serrated edges and flanked by horizontal stripes on either ends.
. Sadaphul It is a floor covering which has big geometrical flowers at the centre and borders at two ends.
. Bada Mor This is a large sized peacock at the centre with smaller peacocks at the two ends.
. Char Mor Center with chaupada (traditional Indian dice game) surrounded by four peacocks at the corners. Sabai Grass grows extensively in the districts of Midnapore, West Bengal and Mayurbhanj, Orissa. The Sabai grass industry is associated with various activities of raising production of grass and processing of consumer goods such as ropes, mats, carpets, sofa sets, wall hangings and other sophisticated fashionable articles. 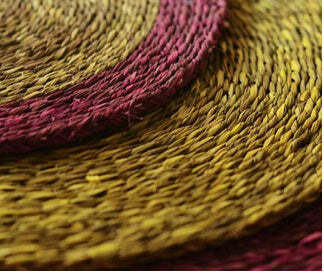 Sabai grass ropes are the main product of 85% artisans in the industry. Bamboo, is the other raw material of great versatility and forms an integral part of the lifestyle and economy of West Bengal. The women make the bamboo basketry in West Midnapore, West Bengal. The menfolk from other tribes make Bamboo ply boards and other wood accessories in East Midnapore. 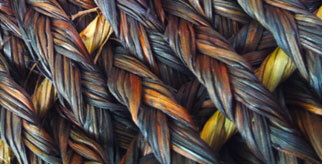 Sabai grass is washed by boiling in water and then coloured by boiling with dyes. It is then washed again in clear water and dried in the Sun. 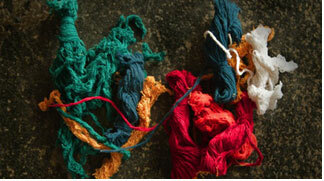 Natural dyes as well as lead free chemical dyes which are skin and environment friendly are used to dye the products. The coloured Sabai grass is dried by spreading on the road. Only finer grass is used for handicrafts. The dyed grass is plaited or converted into ropes by twisting it. The plait is hand stitched line by line using strong cotton threads. The wall of the basket being built by stitching. Splitting of Bamboo is generally done by a small bill hook, which is fixed on a 'v' shaped wooden frame. Then the soft portion of such bamboo split is removed with a bill hook, whereupon the flat flexible bamboo strips are obtained for manufacturing mats. In weaving bamboo mats, the twilled pattern is generally followed wherein three slips are taken at a time and woven breadth wise one after another. As soon as weaving is complete, all the four sides of the mat are twisted a little and tied with a long bamboo slip in order to frame the outer edges which keeps the woven slips compact. Sabai is a hardy grass and thrives best in regions with an annual rainfall of 30 to 60 inches. This grass that used to grow wild is now harvested every 3 months, peak season being November to January. Since its thin long leaves possess high quality fiber, it is used as a major raw material for basketry. Because of flexibility and strength it is utilized for making ropes and other rope based utility items. Sabai rope is woven and coiled over specific frames to give a finishing shape to any utility item. Bamboo-is a fast growing timber and grass! The craftsmen of Purva Mednipur in West Bengal work with this versatile material to create many products. The essential tools required for bamboo craft consists of a bill-hook, a knife and a 'v' shaped wooden frame. Sabai grass and Bamboo strips are very versatile materials which can be easily converted into interesting and beautiful products. Products are made by weaving ropes of dried Sabai Grass and Bamboo strips usually made by rural women folk of West Bengal. Varieties of products are made using the Sabai Grass and Bamboo such as multipurpose baskets, fruit baskets, mats, serve-ware and gift boxes. An array of utility picks like trays and candle-stands are also made from bamboo. In addition, there are different knick-knacks like bamboo paper clips, bookmarks. Bamboo and Sabai craft is being revived with modern design and process improvements. Consumers get a range of home décor and utility products made from a sustainable material. The legacy of the Tambat Craftspeople who handcraft Coppre's products dates to the 17th century when they were invited to Pune by the Peshwas after Shivaji set up the city as the capital city of the Maratha Empire. From making armour, coins, canons, copper utensils, ritual wares for the Peshwa rulers, the Craftspeople embraced the culinary and ritual needs of Maharashtrian communities and crafted traditional products such as utensils and puja items. Passed on through apprenticeship from one generation to the next, today the craft remains in the hands of a few craftspeople with even fewer willing to take on this heritage craft. 'Matharkaam' or beaten work is the distinguishing feature of Tambat craft. The hand-beaten indentations, made by profiled beating hammers, strengthen the object and enhance the inherent rich surface by imparting a mirror-like appearance. It is a skill intensive craft and needs strength, dexterity and a keen hand-foot-eye coordination. It is the only skill that the community could save from the onslaught of mechanization with the coming of British rule, which to date has not leant itself to be mimicked on any machine. Hit by changing traditions, rising copper prices on the commodity markets in recent years, the convenience offered by materials like stainless steel and plastic and the provocative economic opportunities outside the confines of their craft, has led to a near stagnation. Yet some families of the community persevere with this craft of shaping objects from sheets of copper they carry on the ghadkaam (raising, sinking and shaping of the utensil), the crafting of ritual wares, nakshikaam (repousse and chasing); and the crafting of one-off temple objects. 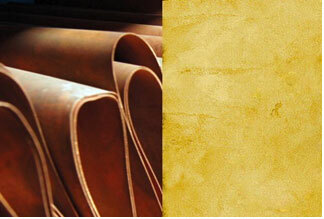 Copper craft relies on a number of factors. The principal raw materials include copper and an alloy of copper. The traditional craft process uses manual shaping and beating. Each step has to be done by hand and takes a long time. The beauty of the art of beating is that it can vary from piece to piece and artisan to artisan. Skill comes into play to achieve the required density of indentations as well as the size and orientation. Different tools such as chisels, hammers, clippers and tongs are used to mould and beat the metal and coerce a shape. Watching a coppersmith at work is spellbinding. Typically, every Tambat family specialized in 'a' particular kind of object. This came about from the traditional system of handing down hereditary tools and know-how to the next generation in the family. And it just so happens that it was also a way to ensure equal distribution of work load and wealth creation. A norm that still exists in some form even today. This art of beaten copper metal brings in aesthetics as well as functionality. 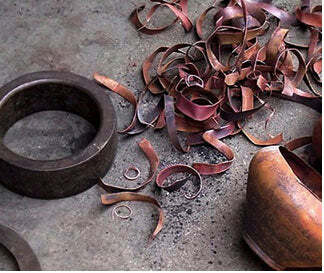 Traditional tambat (copper) products can vary from water containers, serve-ware to playthings for children. Coppre, is an organization that is working with Tambat craftsmen to introduce contemporary designs of copper products that include lampshades, trays, coasters, floaters, candle holders, flatware, utility boxes etc. Copper purifies water and has innumerable health benefits. So the water carafes made in copper are a perfect blend of the old and the new. The carafes bring together the age-old practice of drinking water stored in copperware (Tamrajal) in a beautiful design. Ideating contemporary designs will make Tambat wares amicable to the now. Considered an auspicious metal, handcrafted copper wares aptly reflect the spirit of a wedding. 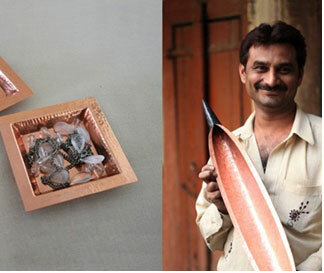 So to enrich a ceremonial wedding copper products are used as wedding gifts. These elegant and exclusive, handcrafted wares are sure to stand out and make a mark. The women of Mithila region of North Bihar are known for their impressive craft skills. From the early centuries they have been making beautiful Sikki Craft apart from the very famous Mithila Painting, Godna Painting, Papier mache, Sujani Embroidery, Appliqué works etc. Sikki is a type of grass of golden colour which is grown in the wet and marshy area around rivers and ponds in Mithila region of North Bihar. The main areas where the Sikki work is still carried out at a large scale are Madhubani, Darbhanga and Sitamarhi in Bihar. Some years ago when there were not so many sources of entertainment in the villages in North Bihar, women used to make different artistic crafts and paintings for their entertainment as well as to make some valuable utility products for their household uses. The sikki is characterized by its wonderful beautiful golden colour, so it is also called Golden Grass. It is also colored into different shades of colours e.g. red, yellow, green, deep blue, purple, and pink, etc. with the natural golden colour to make the final product more attractive. To make the sikki grass usable, it is first cut from its base and then dried for some days. Since the flowering part of the stem of sikki is not used for crafts making, it is discarded and the remaining portion of the sikki is sliced and shaved with the help of a knife or by teeth. Before use, sikki is soaked in water to make it more pliable as it is coiled around the munj. The colouring is achieved by boiling sikki in different colours. Now the main form is shaped with munj to provide the basic shape and additional strength to the sikki product. 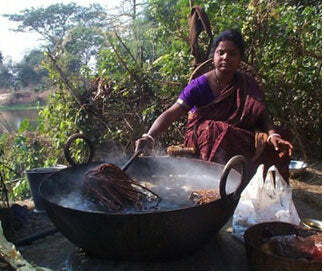 Due to its abundance, generally munj is used for coiling purpose in Maithili region of Bihar. Then the munj is completely coiled over and covered with sikki so that it is not visible through the encasing. Then the main tool, takua is used carefully because it can also cut sikki if the artisan doesn’t use it carefully. The product being made is held firmly with the left hand while the right hand is completely free to wield the takua. Maithili women make different designs and patterns in the sikki product by combining dyed sikki with natural golden colour sikki to give it a more artistic and attractive look. It requires not only skill but lots of creativity, concentration and patience. 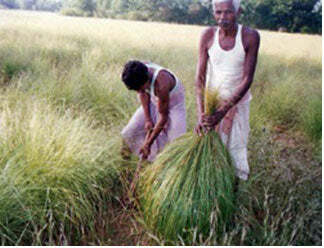 Sikki grass is grown in the wet and marshy area around the rivers and pounds in North Bihar. It is grown in the area of heavy rainfall. This golden grass is usually collected by Harijans in the rainy season. The dry grass is then sold by them at the Haat or local market by the foot. The munj (another grass) and khar are other important raw materials for the making of sikki grass products. Munj is much cheaper and more abundant, so it is used to give basic shape and strength in sikki products. At first munj is coiled and then it is covered with sikki grass. 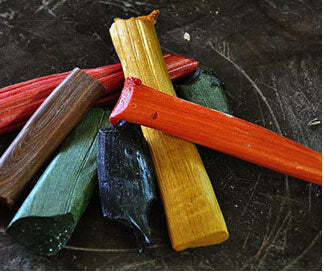 Other raw materials are colours for dyeing of sikki grass. These colours are easily available in the local market.The last and most valuable raw material is water, which is used to soak the sikki grass and make it more pliable as it is coiled around the munj. The main tool used by the Maithili women is a 5-6 inches long needle-shaped iron object with a rounded head for grip is called Takua. They also use a very thin knife (choori) for splitting and scissors (kaichi) for cutting the sikki. At times they also use their teeth for splitting sikki grass. Although Maithili women have been making beautiful utility products from centuries, now they are aware of the choice of the customers and are trying to make different products according to the demand of the market with respect to the design and shapes. Initially women of Mithila used to make utilitarian products (baskets and containers), 2D-3D figures of Gods, Goddesses and animals and birds. But now they are making different variety of utilitarian as well as decorative products according to the demand of the present market. They make different types of traditional containers and boxes for their household purpose e.g. 1. Jhappa- Big containers with caps to store food grains, spices, sweets, etc. 2. Mauni- Trays for fresh fruits, betel leaf and nuts, flowers, etc. 3. Pauti- Beautiful small boxes with caps to keep jewelry, Dry fruits, and other costly items. 4. Gumla- Bowl like containers for various uses. 5. Saji- Flower Baskets. These days artisan of sikki craft artisans are making a variety of decorative products also to get a good place in the national as well as the international market. Phad painting of Rajasthan, is one of them and this particularly stand out for its unique history , origin and the efforts put into its revival. Its a style of religious scroll painting that narrates the local stories of deities and gods. The painting can be unfolded or unrolled after sunset in front of the village for the performance in the night.This is why it is called ‘phad’ which means ‘fold’ in the local dialect. The Phad display the heroic exploits of goods and many Rajput worrior. Characters of the paintings are Devnarayanji( a reincarnation of Vishnu) and Pabuji( a local hero).There are communities involved in making and narrating of the painting; they have priest singers of the Rabari tribe, called Bhopas and Bhopi. Phad paintings is done by Joshi community of Bhilwara in Rajasthan. The themes, usually depicting historic tales of Rajput chieftains are painted on long cloth lengths. All Phad paintings have certain common features. Every available inch of the canvas is crowded with figures. Another similarity is flat construction of the pictorial space. While the figures are harmoniously distributed all over the area, the scale of figure depends on the social status of the character they represent and the roles they play in the story. Another interesting feature is that the figures in the paintings always face each other instead of the viewer. These paintings in their traditional form are very wide to accommodate the numerous episodes of the complex stories. For the making of this unique painting they use thirty feet long and five feet wide cotton cloth.There colour palette is full of natural vegetable colours. They use lamp during the narration of the painting. They consist of red, yellow, blue, green, orange, brown, black derived from the stones and the mineral. The colours are prepared by the women artisans while the preparation of the canvas through applications of starch and kheriya gond (indigenous glue) and ghotana (burnishing) is done by men. Phad artist needs to be extremely skilled for doing this complex painting, it can take between a few weeks to a few months to complete an artwork. Paintings are created on hand woven coarse cotton cloth which is soaked overnight thicken the threads. It is then stiffened with starch from rice or wheat flour stretched, dried in the sun and rubbed with a moonstone stone smoothen the surface and give it a sheen. The entire process of making a Phad painting is completely natural. The artist mix water to colours before applying to the cloth. Each colour is used for specific purpose-yellow for creating the initial outline and in ornamental and clothing, orange for limbs and the torso, green trees and vegetables, brown for architectural structures, red for royal clothing and flags as well as a thick border, and blue for water or curtains. Black is applied at the end as outlines. The eyes- the most important detail in the painting is added last. Once the eye portion is done it becomes alive and then its ready to worship. Mainly the phad painting is the main product of this craft. But due to less consumption of this product from the costumers the artisans have blended it with other traditions and are using it on apparels etc and making the same painting characters on the sarees, curtains, bedsheets.etc. Basically the textile sector where they have cloth as the base medium. Assam is a land of natural diversity and within its territory you get majestic, lush tea gardens and it also has the biggest river island of the world, namely Majuli. Located in the Brahmaputra River, Majuli island remains a large tourist draw in Assam for its natural bounty. However, the island is also home to the ancient and impressive mask handicraft tradition of Assam. Bhaona forms the traditional art of popular theatre performed in Assam. It usually has religious content based on the scriptures of Mahapurusha Srimanta Sankardeya. When presented in the form of a play it is called Ankiya Nat and their staging is called Bhaona. These are usually performed at the satras in village and urban setting in Assam. Masks, costumes and jewellery form an important part of presenting the different characters of the play. These masks represent mythical characters like Ravana, Garuda, Hanuman and other epic characters. Masks of animals like deer, monkeys, wild boar and different birds are also made as required. The masks, which usually take 10 to 15 days to make, are made from locally available materials like bamboo, cane, cloth, clay and vegetable dyes. Primarily bamboo and cane are used as the main frame and after the basic structure is formed, clay layers (no plaster of paris is used – only local mud) are applied followed by application of paints on top. One unique feature of these masks is they are quite lightweight, despite large dimensions. Based on size and material used in making a mask, it may take a week to a fortnight before it is ready for use. No synthetic colours are used. 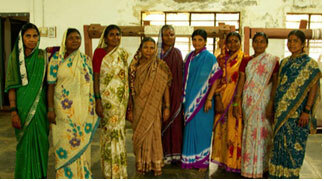 The artisans are resorting to vegetable based colors owing to increasing environment awareness drives. To make a mask the craftsman uses a local variety of bamboo known as jatibanh (Bambusa tulda Roxb) , which is neither immature nor very mature . First with the help of a machete (da) the bamboo is cut into pieces of about 2 to 2.5 meter in length. These bamboo pieces are kept under water of pond or pool for a period of 5 to 7 days . The soaking of bamboo pieces in water prevent insect attack and provide more flexibility to the bamboo tubes . Then with the machete tubes are longitudinally cut into a few pieces from which splits are made with the help of a sharp knife (katari ) . These bamboo splits are woven in open hexagonal pattern to make the base of the mask. Then pieces of fine cloth dipped in sticky clay are pasted over it in layers to cover the structure, which is then dried in the sun. When half dry, a mixture of clay and cow-dung paste is used to shape the eyes and other features while the ears are usually made of bamboo pieces, which are then stuck on and the bark of trees or jute is used for hair, eyebrows and other accessories. Later, a smooth piece of bamboo, ‘kordhoni’, is used to file the mask and smoothen the surface, following which the mask is ready to be painted with earth and vegetable dyes. These masks, which represent mythical characters like Ravana, Garuda, Hanuman, monster bird called Bakasura, Sugriva, the fiercest demon of them all, the many-headed Ravana and other epic characters, are in demand only when the bhaonas (portions of the epics adapted as dramas) are performed or during raas festivities in November. Masks of animals like deer, monkeys, wild boar and different birds are also made as required. Dhokra metal Casting of Orissa is synonymous with the traditional craft of bell metal or brass. It is a typical tribal art form and practiced by tribal families. The dokhra metal casting craft is practiced in the districts of Puri, Dhenkanal, Nayagarh, Khurda, Keonjhar, Sambalpur, Mayurbhanj, Phulbani and Ganjam in Orissa. Lost wax technique is used to cast beautiful designs of lamps, boxes, tribal figures, animal figures and Gods and Goddess. The motifs are mostly inspired by the folk culture. Contemporary artisans of this craft also make other utility items like door knob, door handle, ash-tray, butter box, pen holder, candle and incense stick stand, photo frame, tissue box and tissue box. 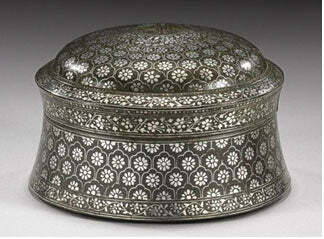 Dhokra or metal ware is practiced by a large number of artisans. The practitioners belong to the Kansari caste. Dhokra metal casting of Orissa is practiced mainly by the 'Sithulias'. Dhokra is an alloy of nickel, brass and zinc. When mixed in the right proportion gives an antique look and augments well with the interiors. • Brass: It is the chief element that is used in Dhokra metal casting. • Bees-Wax: It is the raw substance that is used for making preparing the wax threads. • Clay Bees-Wax Threads: This is wound on the clay model. • Coal: Coal is used in furnace to obtain high amount of heat. 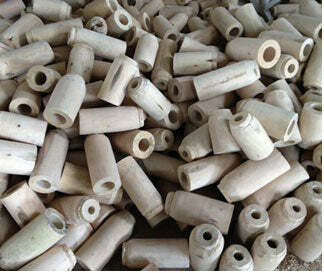 • Furnace: To bake the clay model, furnace is used. • Hammer: Clay mould is removed using hammer. • Graphite Container: This container is used for melting the metal. • Chisels: Chisels are used creating impressions. • Water: It is mixed with mud and kneaded thoroughly to acquire necessary consistency. • Mud: Mud is key ingredient used for making the model of the product. A clay mixture of mud, cow dung and water of appropriate ratio is kneaded thoroughly for the required consistency. Using this mixture of clay a core model is made. Upon this model a pure form of clay is applied as a layer for the smooth finishing. This model is allowed to dry completely. By using lengthy wax threads the whole clay model is completely wrapped with it to form a layer and to obtain the selected pattern of design. On this coating of wax layer, a layer of clay with sand is applied. Usually sand is used here for the purpose of tightness in the mixture. Two channels like holes are made on it and allowed to dry. In these two channels, one channel is made to pour the molten metal hence the other channel is automatically used for releasing the air out. After the clay model is completely dried, a layer of sand mixed with minimal amount of clay is applied. Thus the clay-wax model is totally set ready to bake. The model is thoroughly baked in furnace and the wax in-between the layers of clay gets melted and remains as a hallow space between the layers of clay. Further this model is taken out from the furnace and through a channel molten metal is poured into it. This molten metal is initially obtained by melting the metal crucibles in a graphite container. While heating/melting these metal crucibles a bit of salt is added to obtain the pure form of molten metal which also enhances the further process. The molten metal poured into the clay mold acquires the shape and pattern of the model and acquires the impression of the wax model in fine details. This metal further gets hardened between the layers of upper and inner surfaces of the clay mould. Thus it is dipped in water to cool down the temperature of the metal. Once it is cooled completely then by slightly hammering and brushing the burnt mold, the metal artifact is thoroughly cleaned from both inside and outside. It is further polished all around and sold in market. The cost of the products depends on the workmanship it has undertaken in preparing it. It also varies in sizes and designs. As these products have an antique appearance it is used in many corporate offices as a showpiece and also used for house decorating purpose. Some of the products that are made using this special technique are: Gods and goddesses. The craftswomen of Rajankatti, Makelmardi, Kadoli, Hunnur, Telaganatti, Madanbhavi, and Chikoppa in Belgaum district (which are drought prone regions) in the state of Karnataka who had previously depended upon seasonal wage labor and migration to cities for work.now earn a livelihood by making high quality, naturally-dyed, hand spun, hand woven and non-woven bags from the natural fibres of jute, cotton, banana, mestha fibre, leather, and blended fabrics. These bags are made with using many of Northern Karnataka’s craft-traditions and techniques such as: indigo dyeing of the Neelgars, rope-twisting, folk-stitching and joinery of the Nadafs, vegetable tanning/dyeing of hides and leather-crafting of the Dhor and Samgar communities, wool-felting, spinning and kambal weaving techniques of sheepherding communities. 1. 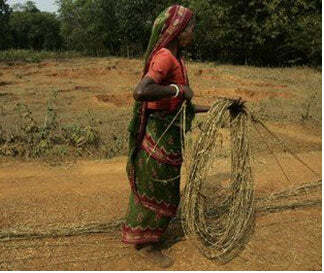 Jute Threads: Thin ropes are used almost the size of cotton yarn usually used in natural color form. 2. Cotton Yarn: Dyed with green, blue, red, black along with many other colors as per requirement. 3. Charkha Wheel: A hand peddled wheel mechanism, used in unwinding the yarn from a larger lot to transfer to bobbins. 6. Pirn: A tool which is fed into shuttle of the loom which carries thread. 7. Cotton Clothes: Fine lining cloth made of cotton to give finishing to the interior of product. 8. Leather Handles: Pre-stitched Handles made of leather, which are durable, leather is used for its strength and it also gives a richness to product. The bag making starts with the weaving of hundred percent jute or Hybrid of Jute Cotton fabrics. In jute fabric, jute threads are used both in horizontal and vertical stitching, in jute cotton, jute is used in horizontal fashion (in shuttles of loom) to hide the roughness, and to give a detailed finish through cotton thread overlaying, jute cotton fabric is in more demand because cotton can be easily dyed in numerous color options and fine smooth texture feel. Jute & Cotton threads comes readymade according to required size, quantity & color to the weaving center, as almost all the fabric made now a days is of hybrid of jute & cotton, jute is used inside the interlacing of cotton threads. Products made here are sold locally and most of them are exported. Handbags, multipurpose baskets are also made along with the popular Laundry Basket. 1. Laundry Bag:Cylindrical in shape, with leather handles, used to hold clothes which are to be washed, generally used near the washing machine. 2. Ladies Handbags: Handbags of different size, shapes and patterns are made according to the current market needs. 3. Multipurpose Baskets:To stock fruits, vegetables or any other dry goods. 4. Pencil Pouch: Its used to keep pencils, pens & other Stationaries. 5. Side Bags: It is used mostly by college students, which can carry optimal amount of documents.